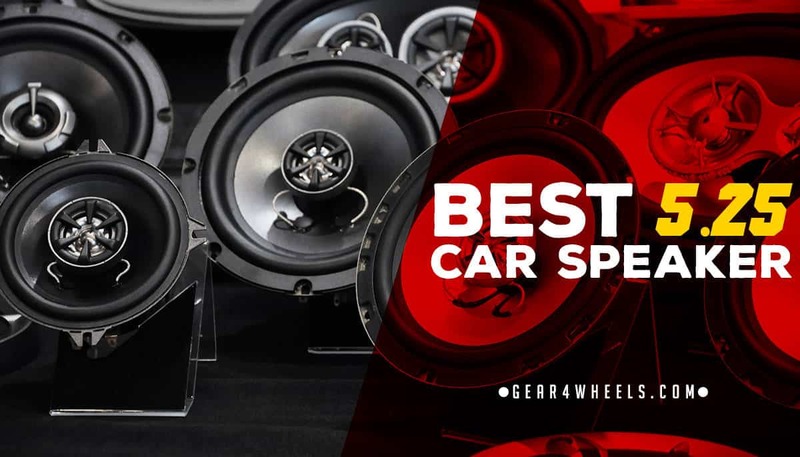 Best 5.25 Car Speakers in 2018 [Reviews and Comparison] - Gear4Wheels. Looking for new speakers? Look no further. I've spent 90+ hours testing and researching the best 5.25 speakers on the market to bring you a summary of the top 5.25 inch car speakers​ you can buy in 2019. If you're in a rush, make sure to check the comparison chart to get a quick idea of which options are going to suit your needs best. Integrated crossovers for simplified wiring and installation. As 5.25-inch speakers go, these are definitely some of the finer component speakers you can purchase. The sound is loud without distorting even at higher volume, and they are easily capable of being driven by factory car stereos if you opt not to upgrade. 50-watt RMS power means no need to install a separate amplifier, and these speakers have built-on crossovers for differentiating between their high and low frequency sound output. Another interesting perk with this pair is that they include both 5”x7” and 6”x9” adapter plates for use in larger car door speaker mounting systems. These speakers peak at 100-watts, which should not pose a problem for factory car stereos, but if you intend to upgrade to something more powerful per channel or install an independent amplifier, these speakers may not be the best choice. Additionally, the low end frequency range is somewhat higher than other speakers in its class, meaning that bass response may not be as good as comparable models. To say that these are some powerful 5.25-inch speakers would be a gross understatement. With a standard draw of 85-watts per speaker and a peak power handling if 225 watts, these are some insanely loud yet crystal clear car door speakers. I﻿nfinity also has a sterling reputation for building high quality speakers that are not only powerful, but also provide the highest possible audio fidelity. Loud and clear are the best two descriptors for these speakers. They can be run adequately off of a factory system, but in order to really get the full Infinity speaker experience you're going to need to amplify this set. These speakers still sound amazing at lower power levels, but they really shine when they have enough juice to drive them at higher power capacity. Crossovers for theses speakers are separate units that have to be installed individually with each speaker and wired up from the amp/head unit individually to split the sound frequencies between highs and lows. This may make it a little tough on first time installers. An amplifier of 200-watts is recommended to get the most out of these speakers. Alpine has a longstanding reputation for building some of the most powerful car speakers that outperform the competition no matter what. This is no less true of their SPR-50C series speakers, which are 2-way speakers with detachable tweeters. Providing excellent power for their size, these 100-watt RMS speakers can deliver earth shattering volume with excellent audio fidelity. They also maintain that high quality audio even when pushed to their 300-watt max range, making them an exception feat of audio engineering. The power draw on these starts at 100 watts, which may be more than a factory stereo head unit can handle on its own. Also, the tweeters and woofers for these speakers must be manually wired to their crossovers since the frequency splitters are not integrated. The frequency range is also somewhat limited compared to similar speakers in its class. As 2-way speakers go, these C2-225s from JL Audio really have a brilliant audio quality that balances well between lows, mids, and highs. They also provide a good amount of power in a small package, making them ideal for mounting in smaller car door enclosures. These speakers have a modest 60-watt RMS power draw from the amplifier, but you would never know it to hear the thunderous bass, rich mid level frequency response, and crystal clear highs. This lower power requirement makes them more compatible with existing hardware without needing a more powerful amplifier. However, their peak capacity can definitely handle more powerful stereo head units if you decide to upgrade yours later on. As with many powerful car speakers that have a lower RMS, these speakers sound great on a factory car stereo, but they are positively transcendent when rigged to a powerful standalone amplifier or car stereo head unit. For those car audio enthusiasts looking for an excellent set of powerful speakers that won’t blow up their factory car stereo, Rockford Fosgate offers their ever popular Punch series. These 2-way coaxial mounted component speakers can crank out rumbling lows, rich expansive midrange, and bright highs that make your music come to life in your car. The lower power draw of these speakers makes them easier to integrate with an existing car stereo. Their overall audio quality is excellent, and they are quite loud considering their power output. Another added bonus not seen on many speakers in this category is their integrated crossover, making installation and wiring significantly easier. These speakers don’t really allow for much in the way of upgrading your amplifier/head unit in the future as they peak at 80-watts per channel and may not perform well under those circumstances. OEM mounting adapter may prove challenging for first time DIY car audio installers. These two ways offer excellent frequency response, booming bass, rich mid range tones, and crystal clear highs. Add to that their factory car stereo friendly 50-watts RMS, and these are clearly the best 5.25 car speakers on the market.